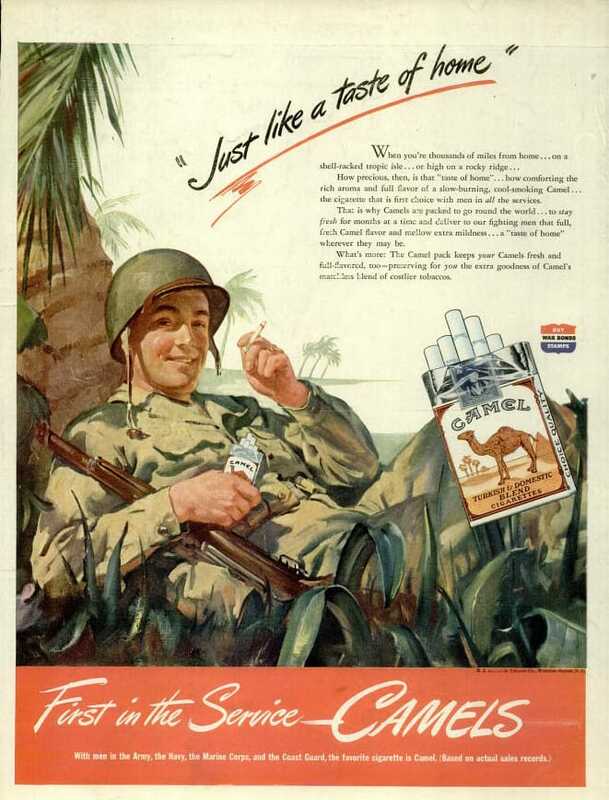 WW2 Camel Cigarette Ad July 1944 - "Just like a taste of home"
How precious, then, is that “taste of home”… how comforting the rich aroma and full flavor of a slow-burning, cool-smoking Camel…the cigarette that is the first choice with men in all the services. That is why Camels are packed to go round the world… to stay fresh for months at a time and deliver to our fighting men that full, fresh Camel flavor and mellow extra mildness… a “tates of home” wherever they may be. What’s more: The Camel pack keeps your Camesl fresh and full-flavored, too-preserving for you the extra goodness of Camel’s matchless blend of costlier tobaccos.